The computer gods have brought the site back to life, so posts will resume. We’re on Facebook, too, by the way. 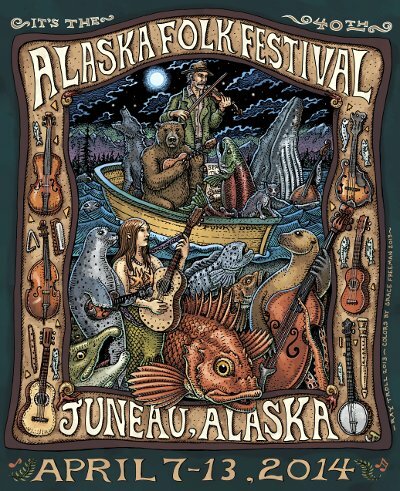 Last week I posted songbooks listing lyrics and chords for easy children’s songs, many of which we are playing in ukulele classes at Juneau Fine Arts Camp this month. There have been some camper requests this past week, so I am posting links for them as promised. Last summer, Trevor came to ukulele for all 4 weeks. When he returned this summer, he was still strumming the chords to Five Years Time by Noah and the Whale, almost always at break-neck speed. It is a fun strumming pattern with a mute/beat in the middle that is very appealing to the older kids. Lyrics & chords are available at Ukulele Hunt. This song is a good one for practicing the transitions between C – F – G – F, and is a chord progression that works for other songs, like Twist & Shout, Labamba, Wild Thing, Louie, Louie,and Get Off of My Cloud. Only three chords and you practically have a busking set! Owen, who is new this year to ukulele, asked me to look up the song Wonderwall, by Oasis. Happily, the tabs provided on Ultimate Guitar had fairly easy chords (Am,C,G,D, and F), so we were able to give it a go with the 4th -6th graders. In looking up ukulele chords for the song, I happened upon this ukulele cover/tutorial posted by DerMoppelt on YouTube with a neat chord progression using variations on the G chord. Elena performed and taught us all Speak Now, by Taylor Swift (tabs). A couple other easier pop songs for these guys are: Little Talks by Of Monsters and Men (tabs); Somebody That I Used to Know (official) by Gotye (tabs) or a fun ukulele team cover; and last summer’s favorite, Hey Soul Sister by Train (tabs). These tab links are from ukutabs.com, a site with a helpful feature that allows you to transpose up or down by half steps until you find chords that you can play. Of course, the chords you can play are not always in a key you can sing, so choose your poison. Finally, for Noah, E Huli Makou by David Chung. This song is included in the 3-chord songbook, but since it is not a familiar one, I am giving a few more resources for those kids who want to keep working on it and parents who want to help them. Chords & lyrics (along with chord charts) are at Kanikapila.us , and a translation and history of the lyrics (with a few different verses) can be found at Huapala.org. To hear the song and get a feel for the strumming pattern and Hawaiian pronunciation, watch it performed by Kealoha at 808ukejams (note: he plays the G7 and C7 during “Ke Aloha” instead of the NC – no chord – pause we have been playing in class.) The kids have all learned the hula to this song, too. You can see them in action on the Fine Arts Camp Facebook Page. As always, everyone is welcome the Sunday ukulele jams at TK Maguire’s lounge, from 11-ish-1-ish. Bring copies of songs you want to play, unless you would rather perform solos! The first week of Juneau Fine Arts Camp was a resounding success, with about 30 kids coming to ukulele classes to sing, strum and dance. If you have a child entering Kindergarten through 6th grade in need of fun, artsy things to do during the next three weeks, you should check it out. In honor of these newest recruits, I am posting 2- and 3-chord songs, many of which we played during camp. Thanks to Amy for turning me on to Songsheet Generator, a program that formats the chords exactly where you want them over the lyrics in a song along with a graphic of the chords at the bottom of the page. The chord graphic doesn’t show up in the songbooks below, but there are plenty of chord charts available online. Many of these songs and more be found on Dr.Uke’s Beginners page. For those adults who are learning to play and have young children in your lives, you may find this list useful as well. I picked up the ukulele again after a 20-year break so that I could play for my son. He now plays ukulele and guitar with much greater facility than his mother -consider yourself warned! In addition to the beginner songbooks below, we are going to try something new for the weekly ukulele jams. The 2nd Sunday Jam of each month will be dedicated to beginners and those wanting to work on easier chords and at a slower pace. We meet at TK Maguire’s restaurant in the Prospector Hotel (near KTOO and the State Museum contruction site). If you want to eat breakfast before you play, come before noon. We will play from 11:30 until about 1:30 or 2, or until our fingers get sore. Of course, all are welcome on any Sunday, regardlesss of ability. And now for the songs…. We are taking a break from the weekly Sunday ukulele jam tomorrow at T.K. Maguire’s so that the mom’s can have their Mother’s Day brunch in peace. We’ll be back at it next Sunday. If you have a mom, play her a song. Here’s a link to the ukulele tabs for a song we sing at preschool when we want to celebrate those we love: Skinnamarink. Enjoy the day and come play with us next week! In anticipation of our local jam spot, TK Maguire’s, being full of Easter brunch revelers, we are taking a break from the weekly Sunday ukulele jam. Next week, it’s back to the usual shenanigans. If you gather with friends and family this weekend, bring out your ukulele, look up a one or two chord sing-along song from Dr. Uke’s beginner page and entertain the troops. Or you can practice the C-F-G-F pattern for “Five Year’s Time” by Noah and the Whale. Ukulele Hunt has chords and lyrics to download and a link to the video, in case you don’t know the tune. At the Folk Fest ukulele workshop we taught this song and used it to work our way through a medley of “La Bamba”, “Twist and Shout”, “Wild Thing”, allowing you to just keep practicing the chord changes over, and over, and over…. As promised, below are the links we mentioned at the workshop. If you find other links you want to share, please add them in the comments or let me know and we’ll get them posted. Safe trip home to everyone visiting from out of town and we look forward to seeing some more of you locals at a jam some Sunday soon! You can find basic chord charts by doing and image search for “ukulele chord chart” and finding the one you like best. Roswick Giles Music store out near the airport also carries a variety of ukuleles and ukulele supplies, if you just need one RIGHT NOW or want to support your local music store. While the Rockwell undergoes renovations, the weekly Sunday ukulele jam will meet at TK Maguire’s in the Prospector Hotel, downtown. From Egan Drive, turn onto Whittier St. (near KTOO, AK State Museum and the JACC). Parking should be very easy, since it is Sunday and the KTOO, museum and Centennial Hall lots should all be pretty empty and available. Technically, we meet from 11-1, but in true Alaskan/Hawaiian-time fashion, everyone trickles in, orders food and starts playing “wheneva’s”, so come late if you don’t plan on eating and are watching your minutes. Fine Arts Camp alumni showing his mom a couple chords. It was lovely out on the docks again last Sunday, but the temps have dropped again and the clouds reestablished themselves over our rain forest town, so we’ll be back jamming at Rockwell tomorrow. Maybe the Re(i)eds won’t go hungry this time! Forecast is for sun. We’ll be at Marine Park on the grass if is sunny. Bring your ukuleles and your shades! If it is sunny we may relocate again to Marine Park. Otherwise, we’ll be at Rockwell’s.